I am thoroughly enjoying this last piece of my life. It brings joy, sadness, wisdom and lots and lots of love. I feel enlightened. I am comfortable, ready, would love to postpone it a little longer to enjoy all the love around me. Thank you all! Françoise comes from a family where art plays a major role. Kees Van Dijk, her father, was a painter and commercial artist and Kees van Bohemen, her uncle, was a well-established painter in Europe. These creative surroundings marked her path to embrace the life of an artist. As a girl of 12, she emigrated with her family to New York City where she attended the Dalton School, a progressive private institution where many artists sent their kids to study. Following her graduation, she returned to the Netherlands and entered the Koninklijke Academy of s’-Gravenhage and s’-Hertogenbosch, where she studied art and was mentored by the well-respected teacher, Pieter Giltay. It is here where she meets her husband, the painter Hans van Uden. Life after the Academy, she graduated in 1971, was lived in the Dutch countryside, where the couple remained throughout the 1970s and 1980s. For well over two decades, starting in 1998, Françoise and Hans kept homes in New York City -- first in Brooklyn then in the Manhattan neighborhood of Inwood -- and The Hague. It was a period that proved formative and tremendously productive for the artist. It is a time when cityscapes appear among the still life work, and the human subjects. It is also when her work in jewelry begins. All these would remain focal to her artwork for the rest of her life. 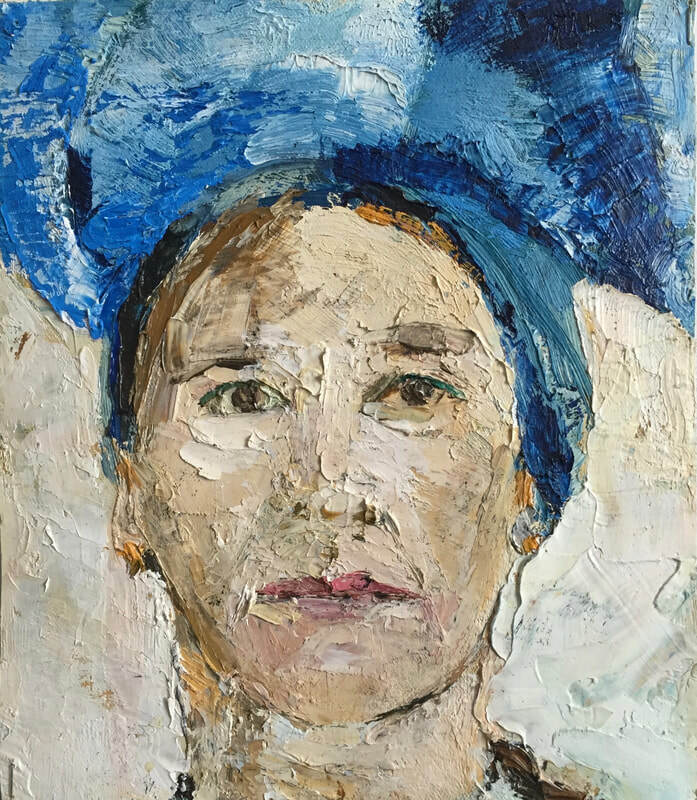 For practical and emotional reasons, the medium of most of Francoise's work is oil paint on paper. "I can roll up work and take it with me on an airplane," she would explain. Her earliest pieces, from the Dalton School period, were already on paper and are a preview for what came later, as shown in these collections. Portraits, still lifes and landscapes dominate her work. 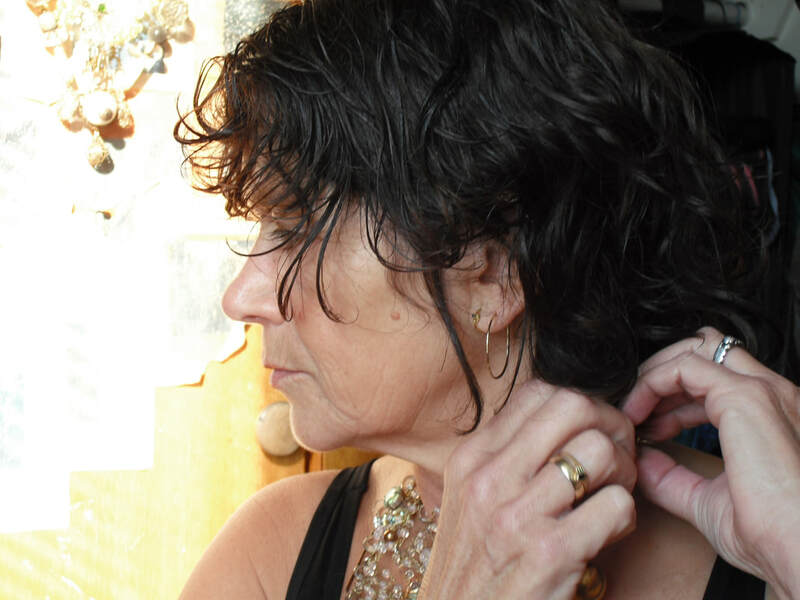 Along with her painting, you find her hand-crafted jewelry -- one-of-a-kind necklaces -- "an enjoyable process of constructing something beautiful and interesting, with simple materials," she would say. Françoise found inspiration in the people around her and their interactions. Models in magazines, family members and friends made their way into her numerous portraits.The bold architecture of fashion and the tactile intricacy of textiles are key components in much of this work and provide both an aesthetic and emotional tone to the human image. Living in the Dutch countryside were important years that instilled in the artist a love for landscapes and nature. Her enduring love of flowers would always find ways to escape the canvas and paper to fill her work space. Carefully dried, flower arrangements crowded window stills, work tables and the walls of her studios. During the two years the couple spent living in Williamsburg, Brooklyn, from 1998 - 2000, Françoise painted cityscapes from the window of their South 4th street loft, which looked across the East River to Manhattan. This is also the period when she created the Rewritten series (1998), small artworks (30 x 22 cm) made of old book covers she found on the streets in Williamsburg. Meeting Jean Betancourt, a Brooklyn artist who works with jewelry, was instrumental in launching Francoise into her own jewelry creation.